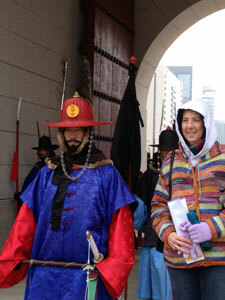 Dr. Friebert and I have been taken to many of the beautiful, historical sites in Seoul, South Korea. One of my favorite trips included the Changdeok and Gyeongbokgung Palaces. In 1395, a few years after the Joseon Dynasty was founded by Yi Seong-gye, the main royal palace construction was completed and the capital moved from Gaeseong to Seoul (then known as Hanyang). The palace was named Gyeongbokgung, which means the “Palace Greatly Blessed by Heaven.” This was the largest of the Jeseon palaces and it was carefully planned to follow feng shui principles, being built on a plain area with a stream close by to the south and mountains surrounding the other three sides. The major halls were built along a north-south axis in a very orderly fashion. This palace served as the residence for the king and his family, as well as a place where state affairs were handled. While we were visiting, we got to see the changing of the guards. Similar to the changing of the guards at Buckingham Palace in London, England, visitors are able to be photographed with the guards after they march across to their posts. In contrast, Changdeok Palace was built as a place for retreat for the king. Every effort was made to minimize disrupting the natural beauty of the hilly terrain, so buildings were small and made to fit into the terrain. The tour through the “Secret Garden” was one of my favorite places so far. Everything was so beautiful and peaceful there. Although some of the buildings were destroyed or damaged over the centuries, many efforts have been made to reconstruct and restore the palace to its original state. On another day, we spent the day touring the children’s hospital. We gave presentations at both Severance Hospital and at the College of Nursing at Yonsei University and talked with nurses about advanced practice nursing in the United States and pediatric palliative care. Yonsei University was originally Chosun Christian College, where Drs. Underwood and Appezeller taught Korean students Western medicine in 1915. In 1917, it was changed to Yonhee College, which was the first private professional college in Korea. In 1957, Severance Hospital and Yonhee College were integrated into Yonsei University. The current children’s hospital was newly built in 2006. Just like the adult hospital, it is a light and pleasing space to be in. Again, I was very impressed with the technology throughout the hospital. We were able to tour the neonatal intensive care unit (NICU), intensive care unit (ICU), stem cell transplant and hematology/oncology wards. We were pleasantly surprised to find that much of the same equipment can be found in our special care areas. One of the challenges is that although a parent is expected to stay with his/her child while the child is an inpatient, parents are only allowed to visit twice a day for 20 minutes, each time in the NICU and ICU. 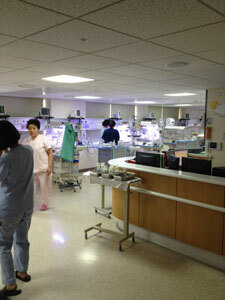 Unfortunately, they do not have a pediatric intensive care unit (PICU), so children and adults share the same ICU. This was a frustration voiced by many of the physician and nursing staff who care for children. Everyone wants a PICU. Later, I had a wonderful opportunity to share my knowledge and experience about pediatric palliative care nursing and being an advanced practice nurse. It was really exciting to discover that along with my Korean nursing colleagues, we share many of the same rewards and challenges. There is a strong focus on quality of care and evidence-based practice, without forgetting compassion. One of the universal challenges for all health care systems always seems to come down to finding money when trying to implement new things. However, it has been reaffirming to see so many other people with the same goals in mind — striving to provide the best care possible for children and their families. One of my favorite opportunities was being able to sit down with all of the nurse managers/charge nurses from the pediatric areas—NICU, surgery, ICU, stem cell transplant unit and congenital heart unit—and address their questions, issues and difficulties when caring for children with palliative care needs. We started to strategize how they can begin incorporating more palliative care into their practice and hospital system. This discussion followed Dr. Friebert’s presentation for the nurses about the importance of palliative care in the hospital setting. Several of our presentations and discussions have generated tearful responses. Strong emotions are stirred with people sharing those precious and sometimes difficult moments of caring for a dying child, while recognizing the importance of supporting these children and their families, as well as the caregivers. Neurosurgeon is one "Tough Mudder"